This composite image shows the massive galaxy cluster MACS J0717.5+3745 (MACS J0717, for short), where four separate galaxy clusters have been involved in a collision — the first time such a phenomenon has been documented. Hot gas is shown in an image from NASA's Chandra X-ray Observatory, and galaxies are shown in an optical image from NASA's Hubble Space Telescope. 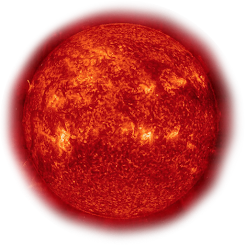 The hot gas is color-coded to show temperature, where the coolest gas is reddish purple, the hottest gas is blue, and the temperatures in between are purple. The repeated collisions in MACS J0717 are caused by a 13-million-light-year-long stream of galaxies, gas, and dark matter — known as a filament — pouring into a region already full of matter. A collision between the gas in two or more clusters causes the hot gas to slow down. However, the massive and compact galaxies do not slow down as much as the gas does, and so move ahead of it. Therefore, the speed and direction of each cluster's motion — perpendicular to the line of sight — can be estimated by studying the offset between the average position of the galaxies and the peak in the hot gas. MACS J0717 is located about 5.4 billion light-years from Earth. 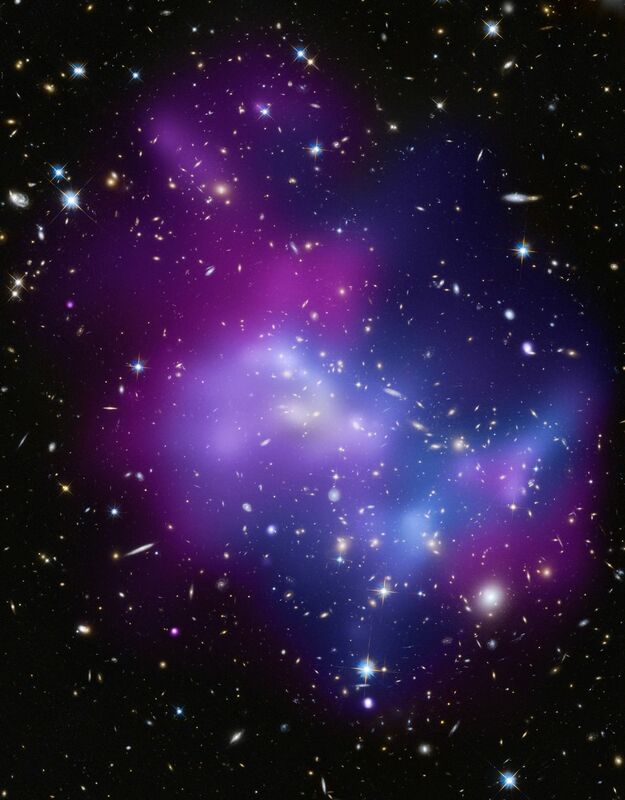 It is one of the most complex galaxy clusters ever seen. Other well-known clusters, like the Bullet Cluster and MACS J0025.4-1222, involve the collision of only two galaxy clusters and show much simpler geometry..